Pens: Cadels: Hiro Rond #1 with reservoir attached. Text: ~1mm & ~2mm goose quills that I cut myself. Line Drawing: Pointed Niko-G nib. Ink: Cadels: Miniatum Ink mixed with Winsor & Newton's Yellow Calligraphy Ink, covered with 23k Transfer gold from lagoldleaf.com. Text: Blots Iron Gall Ink. Guidelines: The visible guidelines on the finished piece were drawn on with a lead-tin plummet made by Randy Asplund. 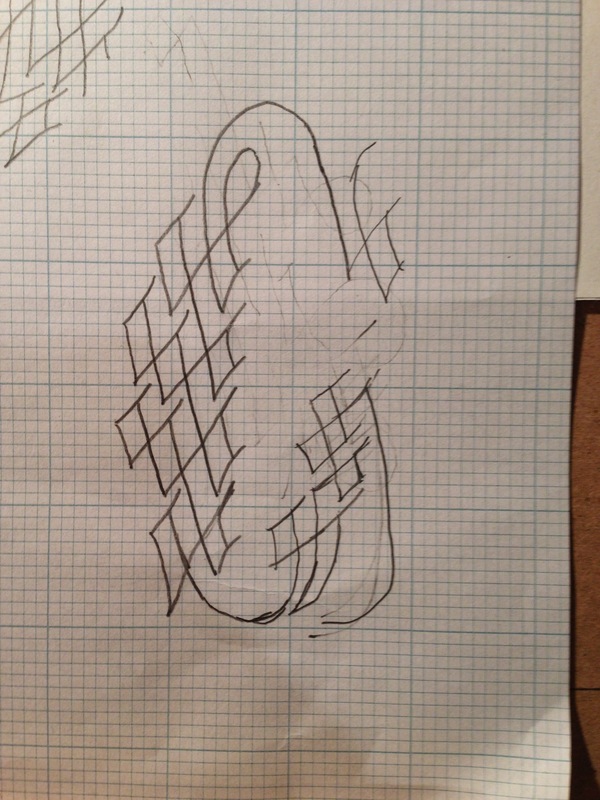 While working, I used pencil guidelines 3 nib-widths (~3mm) apart in a 1:2 ratio of minim-height to interlinear space. Size: The 'O' is 5" tall, the 'G's are 4", the rest of the gold letters just over 1". Finished size of the area filled with ink & paint is about 16.5" by 10". On March 29th, my friend Christian Woolfe was inducted into the Order of the Pelican: a Society-level Peerage award given to recognize exemplary service. It is a very big deal to be made a peer in the SCA. In addition to embodying the quality that defines the specific Peerage (Service for a Pelican, Arts & Sciences for a Laurel, Combat Prowess for Chivalry), a prospective Peer must: "be seen as an example for the Society of courteous and noble behavior suitable to a peer of the realm. They share their knowledge and skills, and have practiced hospitality, according to their means. They will have learned and practice those skills worthy of a civilized court, including but not limited to literature, dance, heraldry, chess, and combat." per the EK Chatelain. When someone is being honored with a Peerage, they are (often) sent to sit in Vigil for several hours to contemplate if they are ready for the responsibilities of joining that Peerage. Peers are the best of us, and once elevated, are expected to act as role-models and inspirations to all in the SCA. As they sit in contemplation, Royalty, Peers, and friends visit the recipient to congratulate and advise them on what it means to accept this accolade. Outside the Vigil room friends gather and celebrate. After the Vigil is concluded, the recipient is processed into royal court surrounded by guards & friends. Frequently, a herald calls out their achievements as they make their way in front of the King and Queen. A member of each of the four Peerages comes forward to explain why they consider the recipient to be their peer, and worthy for elevation. In addition to the scroll commemorating the occasion, they are given regalia: beautiful jewelry and clothing decorated with the symbol of the order they are being inducted into. Most awards in the SCA are a complete surprise to the recipient. Their friends know ahead of time and do what they can to insure the recipient makes it to the event, shows up and puts on nice clothing for court. Peerages require a lot of work that is difficult to keep secret: the Vigil room needs to be prepared; a spread of amazing food is put out for the visitors and recipient to enjoy; the regalia (clothing and jewelry) needs to be made; and of course there's the scroll. If a Peerage is sprung as a surprise, the recipient is sent to Vigil early in the day regardless of what they might have planned to do at the event. In some cases, the recipient is given a writ of summons ahead of time, informing them that they must appear at a specific event in order to sit in Vigil to contemplate a Peerage. 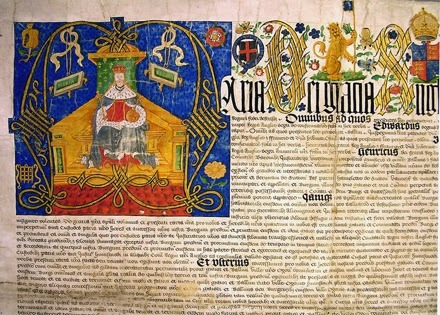 The writ maintains the aspect of surprise, but it also allows the recipient to be consulted regarding his preferences regarding his Vigil, regalia and scroll. It also meant that they go to the event expecting to sit in Vigil for the day, instead of having their plans changed at the last minute. Christian received such a writ at the end January. I've been playing in the SCA with Colonel Woolfe for about 20 years. I'm proud to call him a friend and to be a Lieutenant in one of his Companies. When I started in the SCA, he was one of many who inspired me. He was one of my instructors in the art of rapier combat, and through his guidance I gained the confidence to teach it as well. While I have since hung up my rapier, his example of how to behave in the SCA is part of what inspired me to take on local and regional officer positions and help out the way I do. Christian Woolfe has been a constant force of positive energy for the Province I call home as well as my Kingdom. I can't begin to say how thrilled I am to have seen him recognized this way, and that I was able to be a part of it. Because of how special he is to me, I really wanted to make him something stunning, and pushed well beyond my normal comfort zone. The fact that he inspired me to do so shows just why he was so deserving of this recognition for his service. After receiving his beautiful writ by Mickel von Salm, Christian's instructions to Honig and I were to have fun and be creative with his Pelican scroll. He knows us too well! 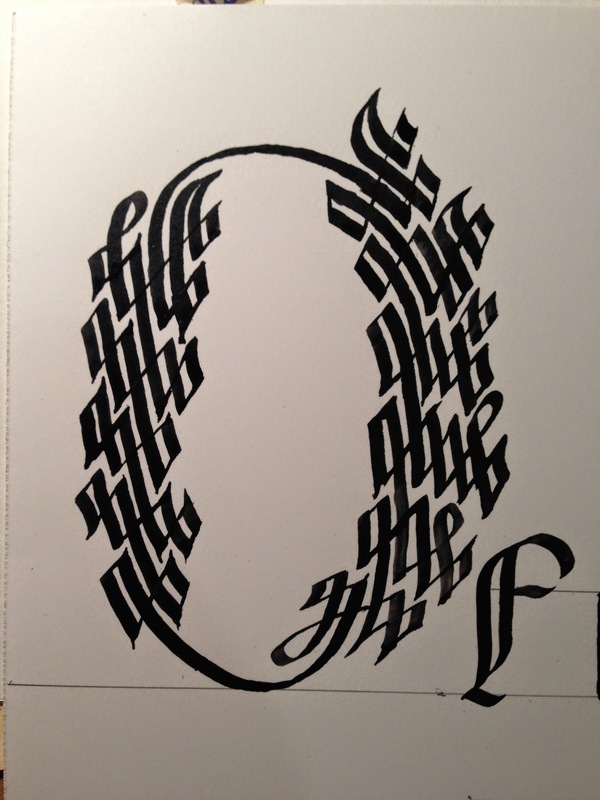 Honig asked me to find something with some over-the-top calligraphic flourishing or cadels. My difficulty was finding an example that was of the correct period for his persona that also included painted areas for Honig to work on. After many searches, I finally found this Early Documents Pinterest Board and the inspirations we needed. 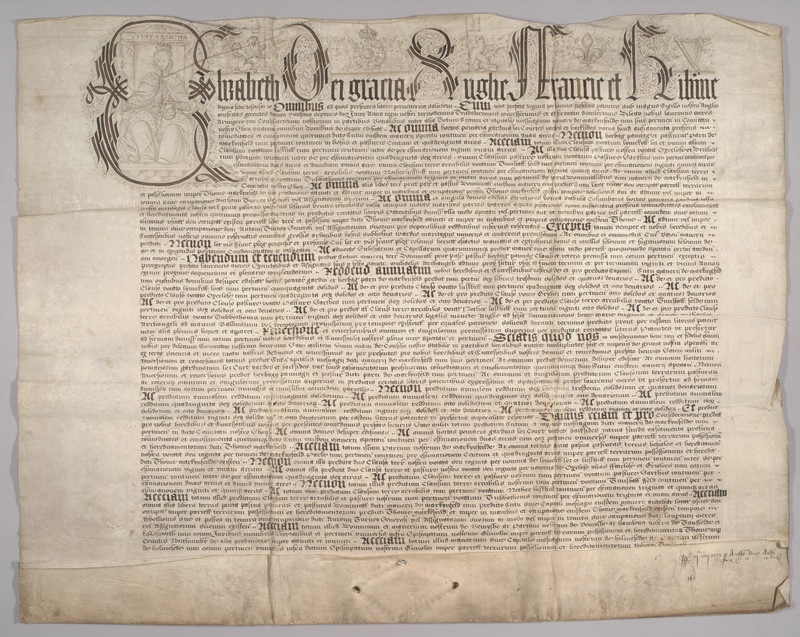 This is the first document that really drew me in. I love the first line with the heavy cadel-based letters and the very clean gothic secretary script. The cadels aren't as impressive, but I really liked the effect of the bolded words scattered throughout the text. Cadels in gold leaf! Oooo... Over-the-top, here we come! And an example in the same overall style that included paint! I wanted to use as many period tools and materials as I could on this project. Much of my recent experimentation with quills and inks was driven by my desire to use them for this assignment. Thanks to that experimentation, I was comfortable with using a quill and period iron-gall ink. I wasn't even horribly nervous about doing so on goatskin parchment. The cadels did intimidate me, especially knowing that I only had one sheet of the parchment; if I screwed up badly, I'd have to switch to paper instead. I got some practice with cadels on the GNEW invitation. 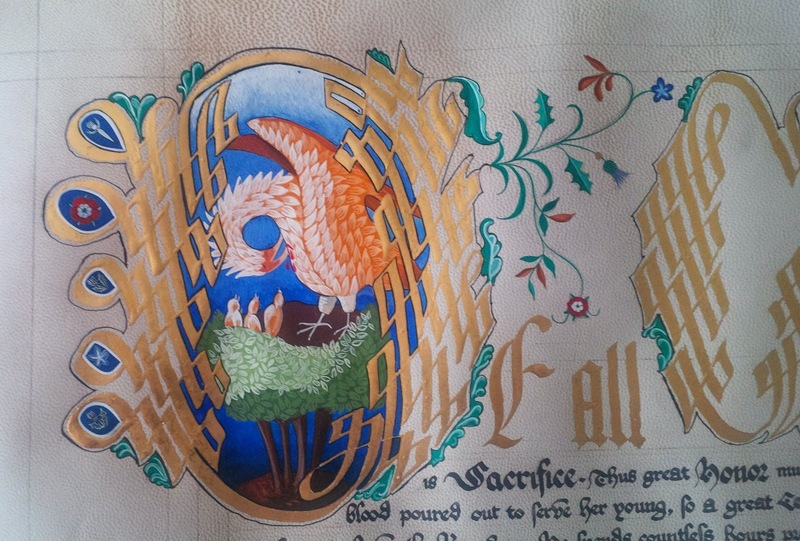 While I'm happy with them, the examples I used as inspiration for this scroll were quite different. I had period examples to copy from that needed very little modification. I couldn't figure out an easy way to plot the cadels in pencil and then ink them. Even if I could have plotted the cadels in pencil, the cadels were being done in gold leaf. With ink, you can erase over it once it's dry. With Miniatum and gold, I would have damaged the gold if I had attempted the same technique. With a small, pointy eraser it would have been possible to erase between the strokes and just up to the edge of the gold, but that seemed like a lot of risky work. The final result is really what mattered to me. As much as I would love to be able to work like a medieval scribe, the quality of the art comes first. 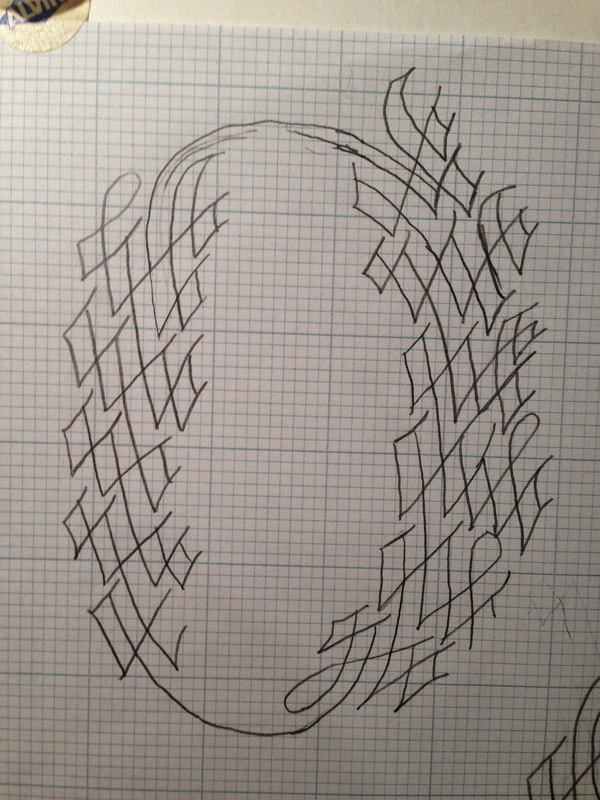 I hope some day to be able to freehand cadels like these, but I will need a lot more practice before that happens. 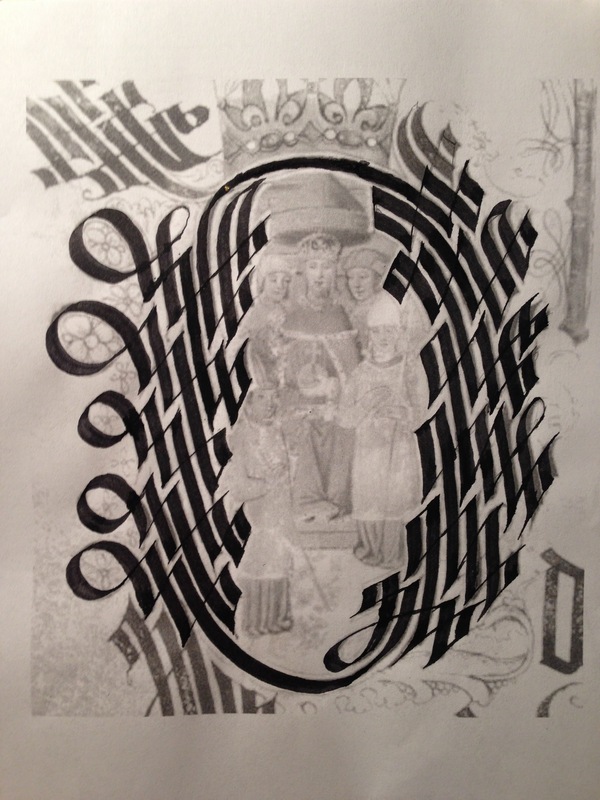 I started with the cadel P from an image of a prayer roll of Henry VIII's from 1516. I printed it out and traced parts of it on my light box in pencil, modifying it to create an O. Then I used the pencil lined version as a base to practice with regular ink and a reed pen. I wasn't completely happy with that result. The reed pen was flowing ink too quickly, and not holding enough of it. My removal of the loops from the left side and the little flip on the top made it look unbalanced. In addition, the spacing of the lines wasn't quite right. So I made a deliberately faded printout and inked just the strokes I wanted to keep so they stood out. I followed a similar process to get the G. I started with the O from my first inspiration document. I traced it with pencil and altered it to form a G.
Then I made an ink version of the G. You can see some of the rest of my practice as well. I was pretty happy with the G at this point. Over several days of planning and practicing the O and G I was finally to a point where I was happy with my results. I tested the process of drawing them on the light box using scrap parchment, Miniatum ink and applying gold leaf. Here's where the second of my modern tool and material compromises occurred. I didn't have time to test with a period gold leaf mordant like glair or garlic juice, so I used a modern commercial equivalent: Miniatum Ink thinned with some Winsor & Newton yellow calligraphy ink. I also discovered that my ~3mm reed pen just didn't hold enough ink or control it properly, so I used a modern metal dip pen with reservoir. During this practice I learned how to hold the parchment against the light box, and adjust the viscosity of the Miniatum so it flowed properly. I let it dry and made sure the gold stuck to it before starting. Since I had a full hide, I started by trimming the top and left edges of the parchment. 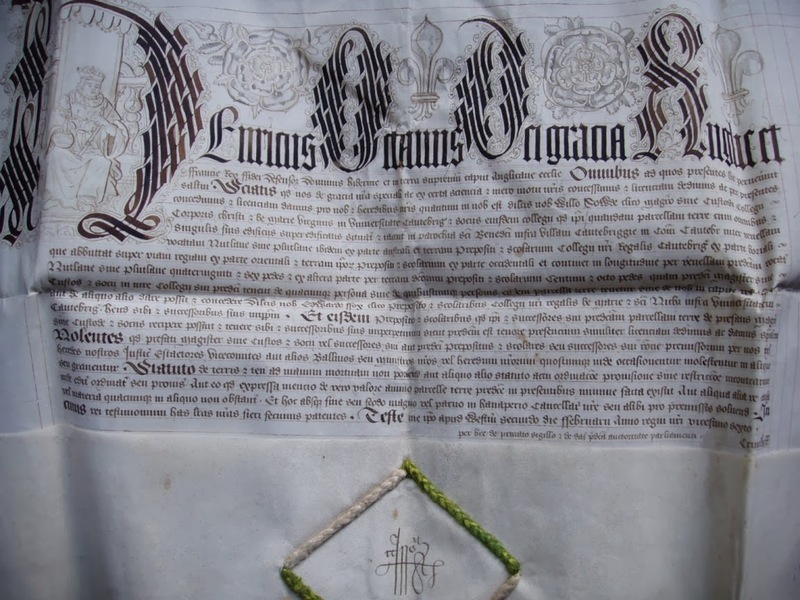 Then I pounced the parchment with gum sandarac and added the outside guidelines with a lead/tin plummet. Laying the parchment on top of the inked examples, I took a deep breath and started tracing the cadel letters with the Miniatum-ink. 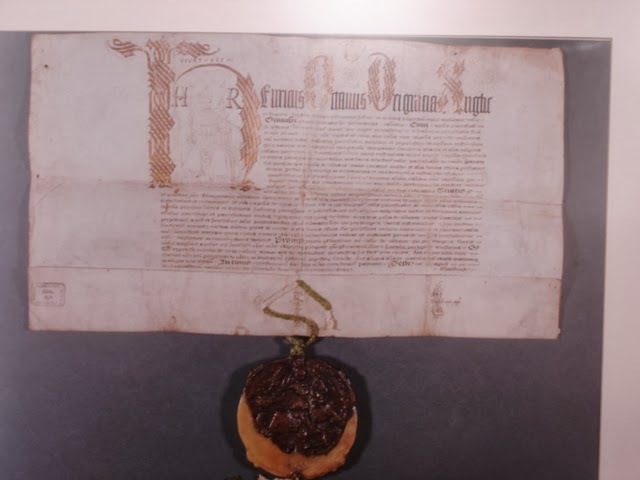 Due to the size of the parchment, and how wavy it was, it was nearly impossible to tape it down to keep it in place. I carefully held it down with my left hand and prevented it from moving while I copied the strokes. I even managed to do this without dragging my right hand across the wet Miniatum! With the first letter done I took a breath... Then I added the horizontal guidelines for the rest of the first line (already shown above) and continued. Finally, the nerve-wracking job of applying the miniatum ink was done. I waited an hour or so for the Miniatum to set, and then applied the gold leaf. I think I used about 6 sheets of gold on these letters. The end result was totally worth it! Before starting the calligraphy, I trimmed off the right hand side of the parchment and added the vertical plummet guidelines for the calligraphy area. I added horizontal pencil guidelines using an AMES lettering guide. 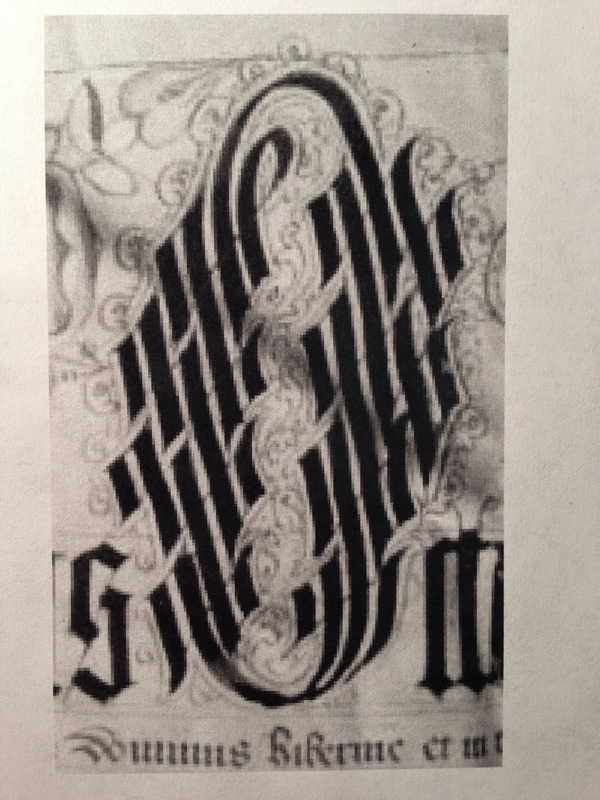 The horizontal plummet guidelines sat between the pencil guidelines, and were added after the calligraphy was completed. I switched between ~1mm and ~2mm wide goose feather quills that I had cured and cut. 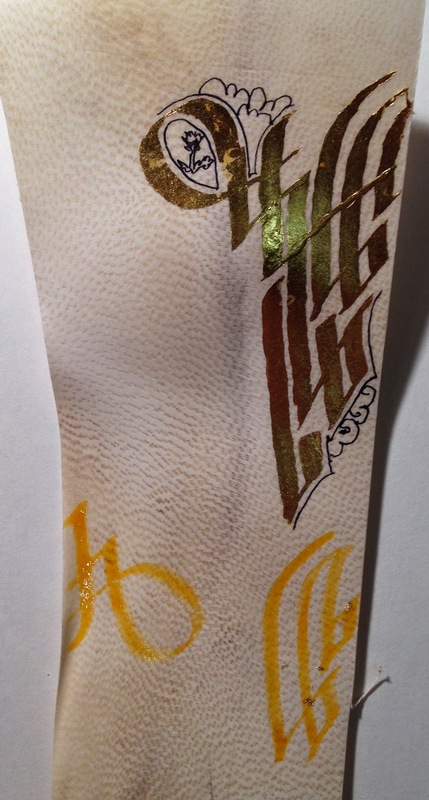 Detail of some of the completed Calligraphy. Minim-height is about 3mm, interlinear space is 6mm. With the calligraphy complete, I trimmed and folded the bottom in preparation for the seal. 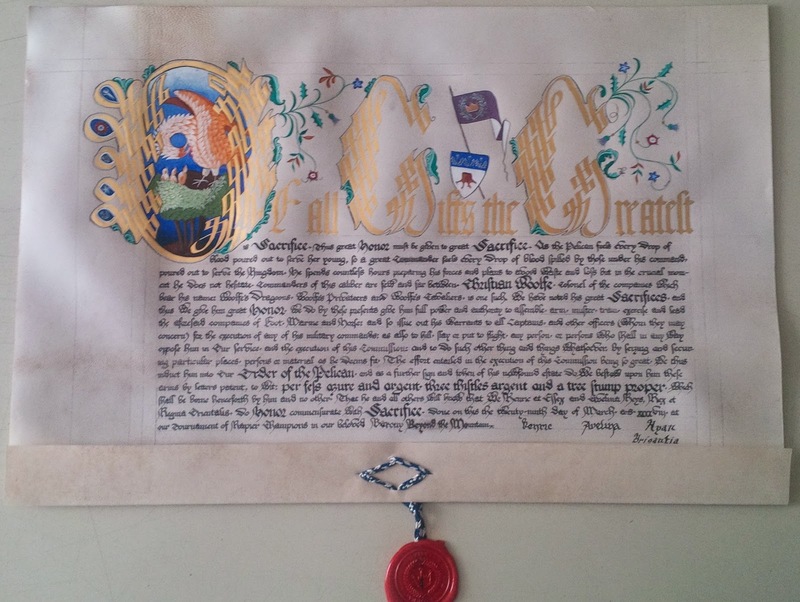 I finished my details by adding some ink lines, doodles, and flourishes around the gold cadel letters before handing it off to Honig for paint, Mylisant for the silk cords, and Kayleigh for the seal. Overall, I'm thrilled with the final result! I've finally learned to relax and not stress about every little area that isn't "perfect". Are there areas I think I could have done better? Always! I'm not saying I've stopped trying to improve. I think my calligraphy is pretty good, but it can definitely get better. The level of control I see in some period examples is incredible, which is even more impressive given how small they often worked. I constantly see little details in the examples that inspire me that I can't quite match. the spacing between words could have been slightly more consistent. Working on real parchment was definitely an interesting experience. As you can probably see in the photos, it does not lay flat like modern paper; it has a wavy surface. This meant I had to hold down the area I was working on so it wouldn't buckle under my pen as I pressed against it. It just so happens, this is an extremely period practice, and is well documented in images of scribes at work. 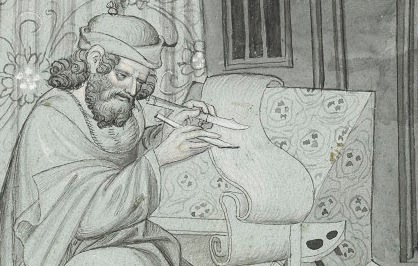 Here's an image of John Mandeville holding the parchment against his writing slope with the tip of his pen knife in his left hand while he writes with his right. I ended up having to use this same technique, and it worked quite well. Of all Gifts the Greatest is Sacrifice. Thus Great Honor must be given to Great Sacrifice. As the Pelican feels every drop of blood poured out to serve her young, so a Great Commander feels every drop of blood spilled by those under his Command, poured out to serve the Kingdom. He spends countless hours preparing His forces and His plans to avoid waste and loss but in the crucial moment He does not hesitate. Commanders of this caliber are few and far between. Christian Woolfe, Colonel of the Companies which bear his name; Woolfe’s Dragoons, Woolfe’s Privateers and Woolfe’s Cavaliers, is one such. We have noted his Great Sacrifices, and thus We give him Great Honor. We do by these presents give him full power and authority to assemble, arm, array, muster, train, exercise and lead the aforesaid Companies of Foot, Marine and Horse; And so issue out his Warrants to all Captains, and other Officers (whom they may concern) for the execution of any of his military Commands; As also to kill, slay or put to flight, any person, or persons who shall any way oppose him in Our service, and the execution of this Commission: And to do such other thing and things whatsoever, by seizing and securing particular places, persons or material as He deems fit. 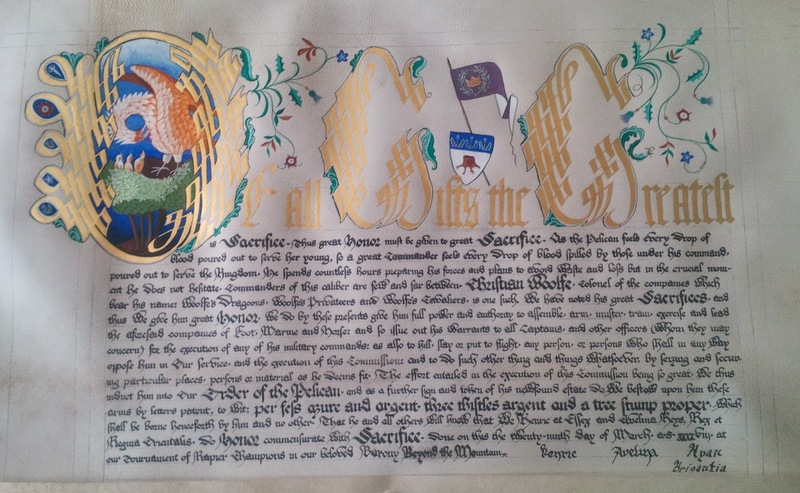 The effort entailed in the execution of this Commission being so Great, we thus induct him into our Order of the Pelican, and as a further sign and token of his newfound estate do We bestow upon him these arms by letters patent, to wit: per fess azure and argent, three thistles argent and a tree stump proper, which shall be borne henceforth by him and no other. That he and all others will know that We Kenric at Essex and Avelina Keys, Rex et Regina Orientalis, do Honor commensurate with Sacrifice. Done on this the twenty-ninth day of March, a.s. xxxxviij, at our Tournament of Rapier Champions in our beloved Barony Beyond the Mountain.